First there were ten-a curious assortment of strangers summoned to a private island off the coast of Devon. Their host, an eccentric millionaire unknown to any of them, is nowhere to be found. The ten guests have precious little in common except that each has a deadly secret buried deep in their own past. And, unknown to them, each has been marked for murder. Alone on the island and trapped by foul weather, one by one the guests begin to fall prey to the hidden murderer among them. With themselves as the only suspects, only the dead are above suspicion. And Then There Were None has had more adaptations than any other single work by Agatha Christie. Many adaptations incorporate changes to the story, such as using Christie's alternative ending from her 1943 stage play or changing the setting to locations other than an island. 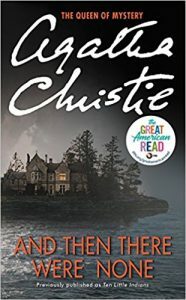 If you like the suspense and mystery of And Then There Were None, check out these titles. Now living in a houseboat on the River Thames, Lacey Flint is becoming a part of London's weird and wonderful riverboat community. But at dawn one hot summer morning, Lacey finds the body of a shrouded young woman in the river. She is no longer a detective, but as she begins to suspect someone is watching her very closely, she can't help but be drawn into the investigation. When a private viewing of works by a controversial artist turns from lively to violent, Fethering residents Carole and Jude believe that the local police are wrong about a suicide ruling and privately investigate suspicions that a murder has taken place. The redoubtable Phryne Fisher is holidaying at Cave House, a Gothic mansion in the heart of Australia's Victorian mountain country. But the peaceful surroundings mask danger. Her host is receiving death threats, lethal traps are set without explanation, and the parlour maid is found strangled to death. Phryne's attention has definitely been caught. Her search for answers takes her deep into the dungeons of the house and into the limestone Buchan caves. But what will she find this time? The naked body was lying in the tub. Not unusual for a proper bath, but highly irregular for murder - especially with a pair of gold pince-nez deliberately perched before the sightless eyes. What's more, the face appeared to have been shaved after death. In this, his first murder case, Lord Peter untangles the mystery of the corpse in the bath. View more suggestions for And Then There Were None.